Have you downloaded and installed Google Earth 5? Good. 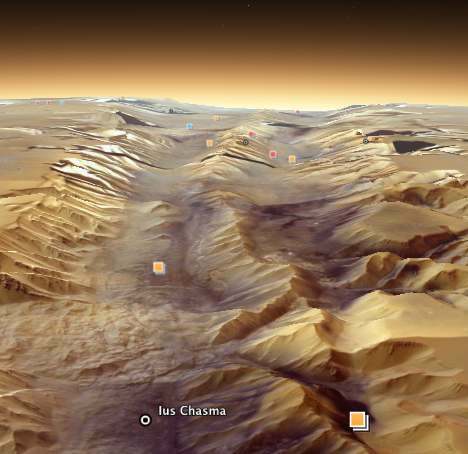 Before we start — Google Earth 5 comes with Google Mars! Click on the planet in the top toolbar and choose Mars. And once there, you get a whole new set of content to choose from, including some great new recent satellite imagery from HIRISE. 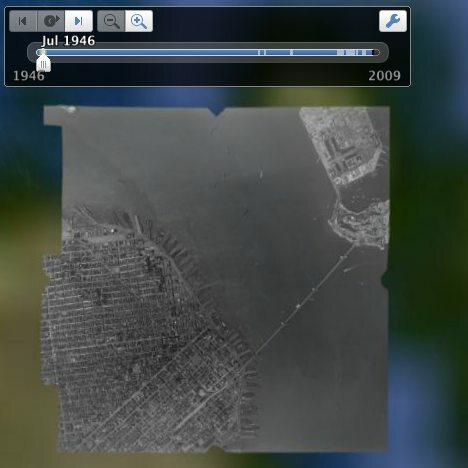 Google Earth 5: Historical datasets from Stefan Geens on Vimeo. The other big new feature is recordable tours. Click on the video camera button in the top tool bar, and a recording button appears on the screen, together with a microphone. Click on the recording button to start recording your navigation in Google Earth, and if you click on the microphone you can add realtime audio commentary. It’s important to know what this tour feature doesn and doesn’t record: It doesn’t record what overlays you have showing in Google Earth (or Mars or Sky) which popups you click nor if you are changing the historical background dataset. You can’t therefore use it all by itself to show specific content in Google Earth — you’ll need to tell the user what to turn on first. (I suppose you could use the audio track to tell him/her that.) The most likely use for this touring feature will be to include it in a larger KML file that you provide for people to download, with content that is visible by default. Tracks4Africa has been re-promoted to the Gallery — or rather, an expanded collection of placemarks by Tracks4Africa are now in the Gallery, while the road tracks are still in the “More” default folder. This is the only new addition to the Gallery and Global Awareness default folders, but that’s understandable, as the focus with this release is resolutely on the oceans. The Mac version looks at lot more Mac-like. Buttons get a refresh, and the overall feel is sunnier. the “More” default folder now also contains 2009 DigitalGlobe coverage. Switching to Mars, turning on an satellite image overlay and then switching back to Earth will continue show the downloaded Mars overlay,but on top of Earth — just like with Google Sky in Google Earth 4.3. Since the Places layer is shared by all datasets (Earth/Sky/Mars), you can however easily turn it off there. 3DConnexion’s SpaceNavigator works out of the box for above-ground work, but still thinks that there is nothing below the ocean surface. To navigate properly below the surface, you’ll need to avail yourself of the keyboard- or screen controls. Now that all that is out of the way, pardon me while I go and play. I don’t really know where to start, but that’s a problem I love to have. About “3D buildings now has two subdivisions — Photorealistic and Gray”, this option was before in GE4, it’s not a GE5 new option. I’m talking about Windows version, not sure if on Mac it was. to the <Camera> inside, <gx:FlyTo>. Oh and the 3D navigator works just find under the ocean for me? Again I’m on windows tho, and my graphics card is old, so dont get the animated sea, maybe that makes a differece? Right you are Barry – however, I couldn’t get it to work earlier, and I still can’t get it to record the showing and unshowing of overlays that are in my Places, can you? Or perhaps this is a bug? Yes balloons opening/closing, and enabling/disabling features seems to be recorded. My SpaceNavigator seems to be waterproof – that is, I have no trouble navigating below the sea surface with it. Alas, it still navigates with only 5DOF – no roll function. 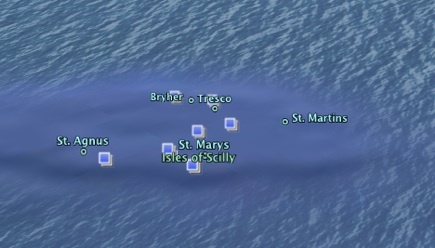 You can remove the ocean surface by unchecking View > Water Surface from the menu. * If you make sure to have the placemarks you want to use in the folder with your recorded tour, then you can deliver a tour with recorded placemarks that work. * SpaceNavigator works fine for me under the ocean. However, I’ve seen various reports from others about issues. Not sure what the difference is. I’ve suggested making sure your applications settings are right in the 3DConnexion preference panel. SpaceNavigator working or not working under the sea seems to depend on the Earth-based/User-based setting in Google Earth (Tools-Options-Navigation on Windows version). User-based works for me, Earth-based doesn’t. 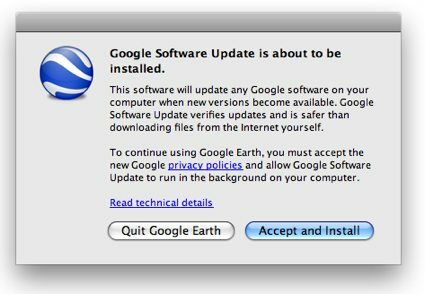 When will Google Earth API Plug in for version 5 available. Why didn’t have traditional chinese traslation for people? Thanks! Why do some heights on Google Mars have negative values?